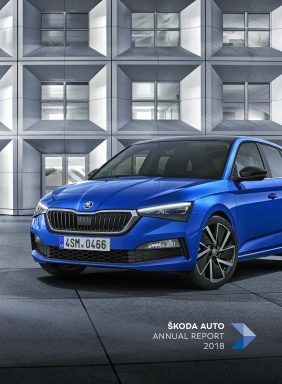 Mladá Boleslav, 28 February 2018 – ŠKODA AUTO looks into the future of the automotive world at the Geneva Motor Show 2018 (6 – 18 March). The Czech automobile manufacturer is presenting a vehicle with CNG, petrol and electric drive for the first time. In addition to the further developed SUV design language, the ŠKODA VISION X also features a newly configured hybrid system. The particularly sustainable drive concept with a CNG/electric engine combination ensures spontaneous power delivery, increased agility and low CO2 emissions of only 89 g/km. The VISION X drives with front, rear or four-wheel drive as needed. The particularly sustainable drive concept of the FlexGreen-painted urban crossover study features an impressive combination of a CNG (Compressed Natural Gas) and petrol-powered drivetrain and two electric motors. The new technology keeps CO2 emissions low at only 89 g/km. The internal combustion engine is a 1.5-litre TSI G-TEC four-cylinder turbocharged engine specifically designed for use with CNG (compressed natural gas). The CNG drive produces a maximum output of 96 kW (130 hp) and a maximum torque of 250 Nm. One CNG tank is located under the rear seat; the second behind the rear axle. The CNG unit drives the front axle; an electric motor drives the rear axle. This is activated as needed – to engage additional power when starting (boost effect) or to improve the traction on smooth surfaces and off-road. The capacity of the compact energy storage unit for the electric motor is sufficient to drive the concept study over a distance of up to two kilometres on electric power alone. The VISION X is ŠKODA’s first all-wheel-drive vehicle without a cardan shaft. This has clear benefits: Lower weight automatically means less consumption. In addition, the electric motor only starts when needed. Two electric motors support the CNG drive. The four-wheel drive consist of the combustion engine equipped with one of the two electric motors – a belt-driven starter-generator (BSG) and the second electric motor on the rear axle, powered by a 48-volt lithium-ion battery system. Thanks to recuperation, the lithium-ion battery charges while driving: During braking and rolling, the VISION X converts kinetic energy into electrical energy and uses this energy later for driving. The maximum torque of 70 Nm is available from standstill, noticeably intensifying the spontaneity when starting and the agility in short bursts of speed. The advantages of the rechargeable batteries include low weight, higher capacity and affordable price. The study drives with front, rear or four-wheel drive as needed. The rear-wheel-drive brings 1000 Nm to the road, and the model has a range of up to 650 kilometres thanks to the additional petrol reserve tank. 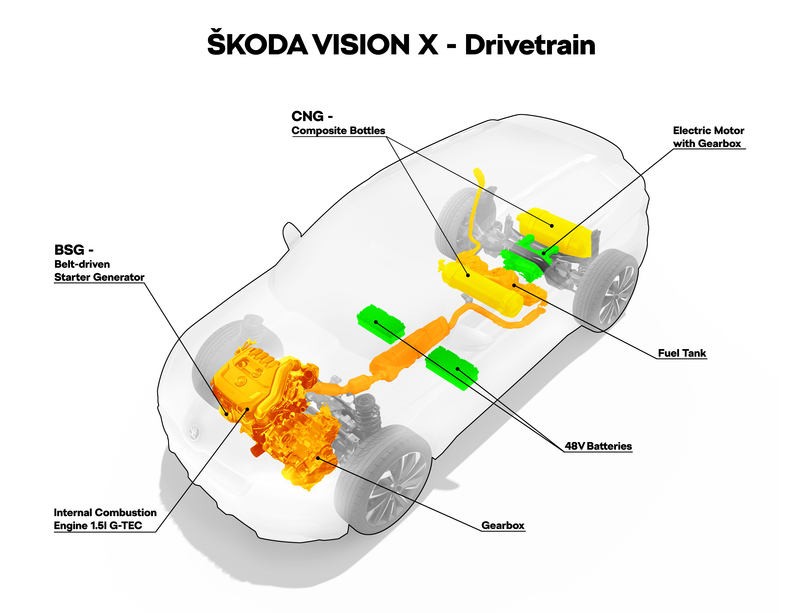 The system performance of the two drive units enables the ŠKODA VISION X to accelerate from 0 to 100 km/h in 9.3 seconds, with a top speed of 200 km/h. Electro-mobility plays a crucial role in ŠKODA AUTO’s global growth strategy. The electrification of ŠKODA’s model range will start in 2019 with the introduction of the ŠKODA SUPERB with plug-in hybrid drive. In addition to the production of electric cars, the plant in Mladá Boleslav will also be producing electrical components for the plug-in hybrid models of several Volkswagen Group brands from 2019 onwards. 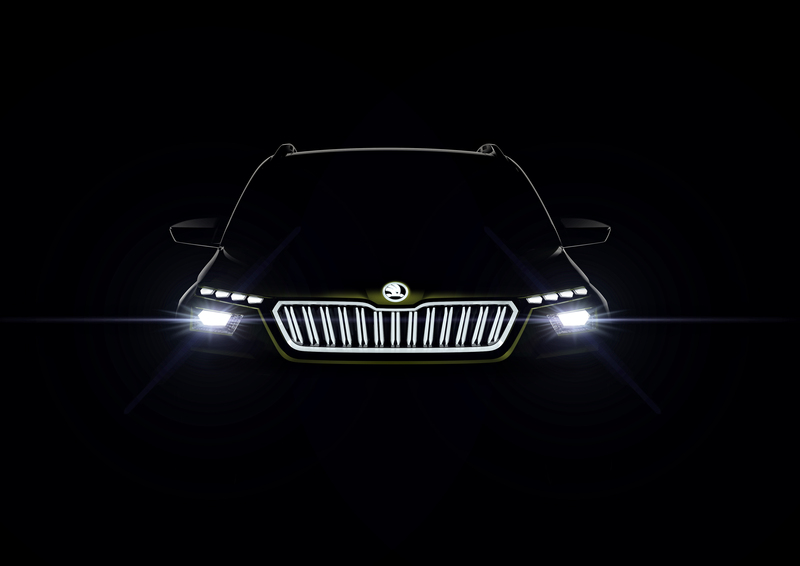 The first fully electric ŠKODA production vehicle will follow shortly afterwards. By 2025, the brand will have expanded its range of hybrid and battery-powered models in various segments.